It’s been quite a while since I’ve seen a display of Northern Lights as good as this one. But with the Sun picking up in activity from a record lull in the last few years, great all-sky displays like this might become more frequent. The last time I saw aurora cover most of the sky like it did last night (August 5) was back in the days of shooting film. 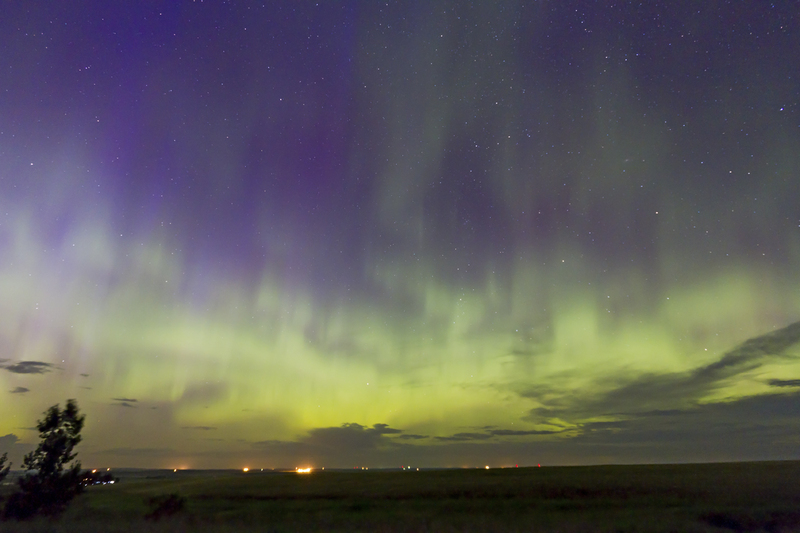 So this was the first chance I had to shoot an all-sky aurora with digital cameras. This is with the Canon 7D and the ultra-wide 10-22mm zoom. I also shot with the fish-eye 8mm, and an “all-sky” movie of those frames will be in the next posting. This display was widely seen and predicted, as solar monitoring satellites had observed major flares on the Sun earlier in the week and tracked the resulting “coronal mass ejections” across the solar system. We knew they were aimed at Earth and would hit August 5. 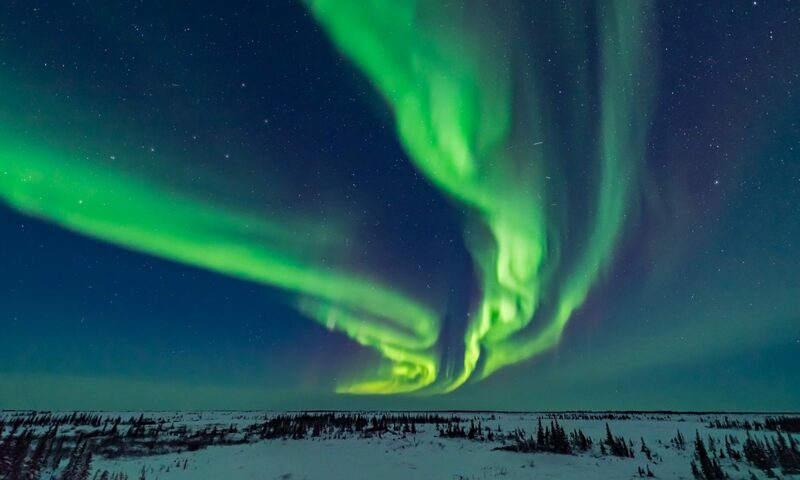 In this case, the resulting geomagnetic storm raged for long enough that people across a wide swath of longitudes from Europe to North America were able to see the display during their local night, August 5/6. Even people in the northern U.S. had a good look. While the display was certainly active and extensive it never did get really bright. So this one still falls short of the “10 out 10” scale for spectacle. Nevertheless, as digital cameras can do so well, the images picked up the greens from glowing oxygen with remarkable intensity. More interesting are the purples, seen toward the beginning of the night but then they faded away. The purple tints come from the tops of the towering curtains of aurora which often glow red from nitrogen molecules at very high altitudes being charged up and excited. But the tops of the curtains can also be lit by sunlight. The blue from the sunlight and the red from the aurora itself mix to produce a purple tint. Only the camera picked this up.